Anne Grady is not your typical motivational speaker. She is a best-selling author, two-time TEDx speaker, trainer, survivor, optimist, inspirer, and a truth-bomb dropper. Anne has a master’s degree in organizational communication and has spent the last twenty years working with some of the largest organizations around the globe. She has become known as a leading expert on communication, leadership, emotional intelligence, and resilience, contributing to Harvard Business Review, Entrepreneur, Fast Company, Inc. Magazine, FOX Business and more. 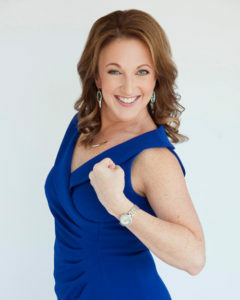 Anne is known for her raw honesty, edgy humor, authenticity, and insight, sharing inspiring personal stories, cutting edge, research-based content, and implementation tools to transfer learning into real life to improve relationships, navigate change, and triumph over adversity. And she’ll make you laugh while she does it. Anne is the best-selling author of two books: 52 Strategies for Life, Love & Work and Strong Enough: Choosing Courage, Resilience and Triumph. Anne says she had a clear plan for her life and is very goal oriented, but because of unforeseen circumstances, it seemed like everything she had learned wasn’t working. She had to start from scratch. One of her critical habits is exercising. She has learned that it’s one thing that elevates her mood and helps her stay productive if she does it consistently. She finds meditating underwater especially calming. Another of her critical habits is staying close and connected to friendships. It’s important to maintain connections as they’ll help you through tough times. She says this comparative suffering is an exercise in futility. Whatever you’re going through is very real to you! The tough part of having a child with mental illness is that everything looks normal from a glance. She says that it’s easy to think you’re nuts and question what you’re doing wrong as a parent. Don’t discard your feelings and challenges though because it’s real to you. Anne work with the National Alliance on Mental Illness. It’s important to give back and be part of a bigger community. It helps build resistance. Most of us go through life reacting. The problem with reacting is that you relinquish control. You let other things decide your mood and actions. The brain likes to create cognitive shortcuts. It takes anything you repeatedly say or do and makes it a habit so that it doesn’t have to work as hard. Our brains don’t know the difference between good and bad habits. You have to tell it. Pay attention to your habits and take control of your life. We have to make moment by moment choices. The more imbedded a behavior or thought process is, the more strengthened it is. It’s easy to blame external situations. They are very real and very valid, but that doesn’t take away the fact that you have to make a choice of how you’re going to react and carry forward. Depression and anxiety decrease when people stay away from social media for long periods of time. It builds up the center of the brain that regulates emotion. The average American touches their phone 150 times a day or roughly every 6 minutes. We’re afraid to be still with our thoughts. Take 5 minutes a day to meditate. It’s important to have a clear vision of what you want your life to look like so you can endure the tough parts. It’s like swimming towards a lighthouse. If you have the objective in mind, you can weather the rough spots. Anne has written two books and has made them to be interactive so that you can identify what’s holding you back. Anytime we’re upset or disappointed it’s usually because our expectations are out of alignment with reality. Most of us try to make drastic changes only to get frustrated. Start small and take it one step at a time. Share with us how you believe your mindset affects your life? Neurologically we have emotions and you can’t change that. However, you can change your thought about something. What do you want to find today? Good, look for it. What do you do daily to bring Energy into your life? She givers herself permission to be human. We don’t always have to be happy or have energy or be motivated. Everyone has crappy days, so don’t beat yourself up. Share the number one connection that has made the biggest impact on your life? Her husband is her number one connection. She has learned what’s most important and to appreciate the things she values. He’s her VP of everything. Define in one sentence or less, what legacy you want to leave on the world? Live on purpose. Make choices to get where you want to go. Order your copy of Positive Culture Wins HERE!